Music lovers get a rare treat this weekend with special concerts by two of Florida State University’s premier ensembles. At 7:30 p.m. Friday, the University Philharmonia will host its first concert of the spring semester in Opperman Music Hall, located in the Kuersteiner Music Building. 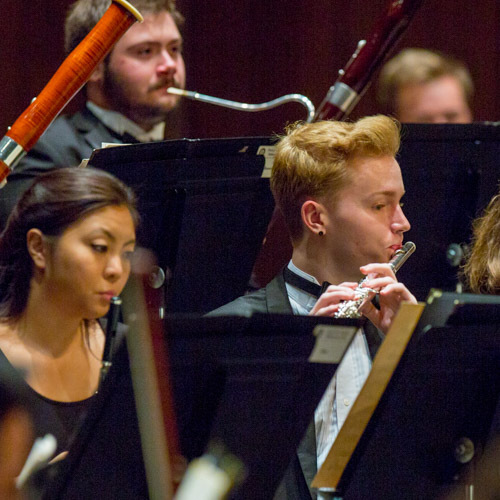 Then on Sunday at 3 p.m., the University Symphony Orchestra will perform the works of three prominent composers during a performance in Ruby Diamond Concert Hall, 222 S. Copeland St. The University Philharmonia concert, “The Four Temperaments: A Symphonic Study of Human Nature,” will include the music of composers Ludwig van Beethoven, Stephen Montague and Carl Nielsen. Montague’s “Dark Sun — August 1945” is described as an evocative world of sound that includes a saxophone quartet, wine glasses as part of the percussion section, old radio broadcasts and a full chorus. Montague, currently a visiting professor of composition at FSU’s College of Music, will conduct the piece. The winner of FSU’s 2018 Doctoral Concerto Competition, Elyse Davis, will be the featured soloist on Nielsen’s Concerto for Flute and Orchestra. Tickets for both concerts are $10, general admission; $7, seniors/non-FSU students; free for FSU students with ID.